Acute bronchitis is an infection causing inflammations of the lungs’ airways and is one of the most common of human ailments. It usually begins with head-cold symptoms — a runny nose, sinus congestion or a sore throat. Bronchitis is almost always caused by a virus but is also (rarely) caused by bacteria. If a cough is not caused by pneumonia, influenza or asthma, it is most likely a symptom of bronchitis. Most people actually feel fairly well with bronchitis, except for having a persistent cough. Fever is rare with bronchitis and mucus production may or may not be present. A very common misperception is that colored mucus, especially green, indicates a bacterial infection and therefore the need for antibiotics. Recent scientific evidence overwhelmingly indicates that viruses also produce green mucus. Viruses are not treated with antibiotics, but rather by one’s own immune system. Those who smoke are much more susceptible to bronchitis because of the damage done by the smoke to the lining of the breathing tubes; germs can therefore enter the lungs more easily, causing an infection. Many patients request antibiotics in hopes of quickly ridding themselves of the cough. They visit their doctor as soon as symptoms begin so that they may “nip it in the bud.” Some think that antibiotics helped them on previous occasions, but there is no proven benefit for these drugs in the treatment of bronchitis. Inappropriate antibiotic use can cause unnecessary side effects, increase the cost of medical care and lead to the development of resistant germs, such as the resistant staph germ I wrote about last month. 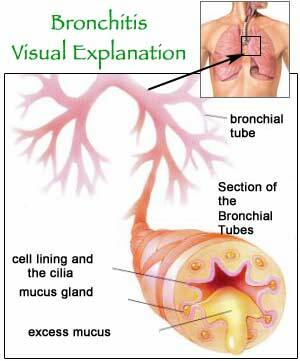 Treatment for bronchitis is directed toward relieving its symptoms. For the head cold symptoms that come with bronchitis, Tylenol (acetaminophen) or Advil (ibuprofen) can be used for the relief of aches and pains. An oral decongestant pill such as Sudafed (pseudoephrine) as well as a decongestant nasal spray, such as Afrin (oxymetazoline hydrochloride,) can be used to combat nasal and sinus congestion. Afrin spray is usually very effective but should not be used for more than one week to avoid rebound (worsening) congestion. Drinking plenty of liquids has proven to be just as effective as an expectorant medication to keep the mucus loose. For cough symptoms, over the counter cough medicines with dextromethorphan, such as Robitussin DM or Vicks 44, may be helpful. If one ends up at the doctor’s office, a prescription cough medication may be given. A cough suppressant, especially if taken at bedtime, will not interfere with the healing process. Also, for a persistent bothersome cough of one to two weeks duration, a doctor may prescribe a brief course of an inhaled medication commonly used for asthmatics. Bronchitis is caused by a virus and antibiotics are almost never necessary. The cough caused by bronchitis often lasts 10 to 20 days. For aches and pains, take Tylenol or Advil. For nasal or sinus congestion, take Sudafed or Afrin nasal spray. For cough relief, take Robitussin DM or Vicks 44. See your doctor if you have concerns regarding your symptoms, but especially if your cough is associated with a fever of greater than 38 degrees C or 100.5 F, or if you have chest pain or trouble breathing.